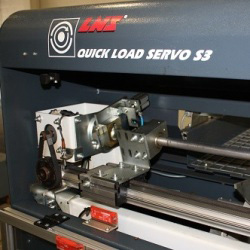 A bar feeder or barfeed is an optional piece of support equipment that allows barstock to be automatically loaded into a CNC lathe, greatly increasing productivity. The feeder is attached to the headstock with a lathe adapter and filled with bars that are then moved through into the work area. More advanced bar feeders can be filled with stock and left unattended so that a CNC turning center can operate lights-out for an entire shift or more. The most basic purpose of the bar feeder is to keep an operator from having to constantly monitor and feed stock into a machine. When a bar feeder is used, that operator is free to do other tasks. Furthermore, each process can be completed faster since loading is now automated. Bar feeders will differ in size and capacity, both in terms of footprint and the diameter and type of stock they will support. It is important to find the right bar feeder for your project. Liberty Machinery buys and sells all types of bar feeders. We are your trusted source for a high quality bar feeder. A bar feeder consists of some sort of bed that supports bundles of barstock (it could be circular), a bar pusher that moves the stock through the end of the feeder and into the chuck, a clamping mechanism, and a system to adjust the position of the feed. The bed is generally not flat, but curved or angled so that all the bars are always resting at the bottom of the bed and are ready to be inserted into the lathe. Often these will have rollers or other ways of ensuring smooth bar movement down to the bottom. The bar pusher can be controlled in a few different ways--either using pressurized oil or air, or using a servomotor with a push rod. Several clamps and anti-vibrational devices hold the rod in place as it turns, ensuring accuracy and stability. The bar feeder will also have various ways to adjust the position of the bar so that it lines up in the center of the hole for the chuck. Most bar feeders are classified as either hydrostatic or hydrodynamic, referring to whether the oil in the channel merely acts as a support or actually moves the bar through the tube. Liberty is always looking for used bar feeders to buy for inventory. Contact us and let us know what you have for sale. We’ll be happy to give you a free quote. See our used Bar Feeders for sale. This video by Haas gives a good look at how bar feeders function.